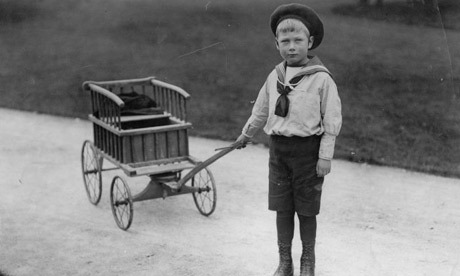 Prince John, the youngest of the six children of George Frederick, Prince of Wales (later King George V) and his wife, Princess Mary of Teck (later Queen Mary), was born on July 12, 1905 in the family's home on the Sandringham Estate,York Cottage. About four years later, it was found that he was suffering from epilepsy, after falling on the floor in a fit. As a child, he may have been a little stubborn. George once confided to U.S. President Theodore Roosevelt that all his children were obedient “except John”. Princess Alexander of Teck described John as "very quaint and one evening when Uncle George returned from stalking he bent over Aunt May and kissed her, and they heard Johnny soliloquize, 'She kissed Papa, ugly old man!'" John was four when he suffered from his first seizure and was diagnosed with epilepsy. He was now described as "winsome" and "painfully slow." Initially, the Royal family had high hopes about his condition since his uncle, Prince Leopold, Duke of Albany, also had the same illness and survived until the age of 30. Apart from his seizures, John also exhibited insubordination and misbehavior, as well as repetitive behaviors. He also showed other disabilities, which have been believed to be signs of autism. As his condition worsened, John was not able to attend his parents’ coronation on June 20, 1911. Cynics, however, accused that the Royal Family was afraid their reputation would be damaged by any incident involving him. According to Raymond Lamont-Brown (2003), John was deemed not "presentable to the outside world," but his father the King continued to show interest in him, providing him with "kindness and affection". As his seizures exacerbated, he and his governess Charlotte Jane “Lala” Bill were sent to Wood Farm (located at a secluded part of the Sandringham Estate) in 1916 in hopes that the prince would get better. It was typical in the 1900s for patients with the same condition as John’s to be sent to epileptic colonies or mental institutions, the British Epileptic Association revealed. Contrary to popular belief, John’s family loved him. They would visit him every once in a while, and John would always be present during Christmas dinners. The sparse visits were supposedly a suggestion from Nanny Bill herself as the governess saw that John’s deteriorating condition “upsets” his siblings “so much, with the attacks getting so bad and coming so often”. Queen Alexandra, John’s grandmother, had a garden maintained at the Sandringham House especially for him, and which became "one of the great pleasures” of his life. After Queen Alexandra wrote to Queen Mary about how John felt “proud of his house but is longing for a companion”, the latter broke Royal protocol and invited local children to join and play with John at the Wood Farm. One of John’s playmates, Elsie Hollingsworth, once revealed about the prince’s naughty exploits. According to her, the young man delighted in lining seats with pins and putting glue on door handles. John maintained "a satellite with his own little household on an outlying farm on the Sandringham estate ... Guests at Balmoral remember him during the Great War as tall and muscular, but always a distant figure glimpsed from afar in the woods, escorted by his own retainers," wrote Charlotte Zeepvat. Prince John died following a severe seizure on January 18, 1919. John’s mother, Queen Mary, wrote in her diary that her son’s death came as “a great shock, tho' for the poor little boy's restless soul, death came as a great relief”. Also, in a letter she wrote to an old friend, Mary felt thankful to God as the young man had “been spared much suffering… for having taken him in such a peaceful way, he just slept quietly into his heavenly home, no pain no struggle, just peace for the poor little troubled spirit…”. George, on the one hand, described his child’s death as "the greatest mercy possible".